Welcome to Dublin, the Home of Gay Theatre! Dublin is renowned across the world as a friendly, vibrant city with a proud tradition of literature, theatre and music. Oscar Wilde, James Joyce, Samuel Beckett, George Bernard Shaw, W.B. Yeats and Bram Stoker all called Dublin home. 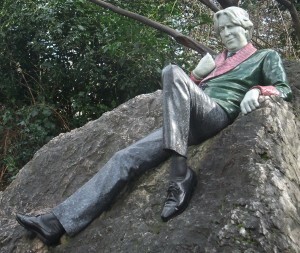 In 2004, to mark the 150th anniversary of the birth of Oscar Wilde, we set out to make Dublin the home of gay theatre and the International Dublin Gay Theatre Festival was born! 13 years and over 2,500 performances later, the Dublin Gay Theatre Festival has grown to become the largest festival of its type in the world and the largest LGBT cultural event in Ireland. Each year we present drama, comedy, musical theatre, cabaret and more in venues centred in Dublin’s historic Georgian heart. IDGTF is the largest event of its kind held anywhere in the world. If you have an interest in theatre and/or LGBT history and culture IDGTF offers a broad, quality programme of drama, comedy, musical theatre, discussions, dance and more. We have a special emphasis on new writing for theatre in our carefully curated programme. Many of our productions are world or European premieres that you may cannot see elsewhere. Many of our productions have gone on to have great critical and commercial success internationally after their run in Dublin. We take pride in giving our visitors – whether audience, participants or volunteers – a warm welcome. Our volunteers at venues and at our box office on the city quays, the tourism & cultural heart of the city, are always on hand to answer any questions you may have during your visit. IDGTF offers great opportunities to engage with others involved in gay theatre internationally and in Ireland. We have a nightly Festival Club where our participants, playwrights, the Festival committee, volunteers and audience mingle and network. The Festival has in itself inspired new works for theatre many due to collaborations and relationships established in previous years. Value for money – we offer great value for money with €15/€13 evening shows and weekend matinees at only €10. We also host a range of free events at weekends. We also offer discounts for groups – if you are travelling as part of a group of eight or more get in touch for more information. Location – all of our venues are centrally located in the heart of the city. Many are located in historic parts of the city including in some of Dublin’s famed Georgian buildings. Diversity – the Festival celebrates the diversity of Dublin and of the international LGBT community. We welcome everyone regardless of gender, sexuality, age or nationality. If you have any special requirements let us know and we will endeavour to assist you. We have an equally diverse programme with something to suit all tastes! We offer special value room rates at our partner hotel. However hurry as this is a limited offer due to high demand. We will have secure online booking from March 2016 so that you can securely book your tickets in advance. Dublin’s legendary pub scene… including a warm and inclusive gay scene. Beautiful city parks and squares. Great restaurants and a wide choice of accommodation. … and of course a warm Irish welcome! Want to find out more? We are happy to answer any questions you have about your visit to Dublin or about the IDGTF. Also please go to visitdublin.com for more tips and information about visiting the city.